6-32, 3 flute, H5 Sowa Yellow Ring Spiral Pointed Tap. 2" OAL, .512" Thread Length. 4.5 pitch lead - intermediate. Click on "more info" for details. 6-32, 3 flute, H7 Sowa Yellow Ring Spiral Pointed Tap. 2" OAL, .512" Thread Length. 4.5 pitch lead - intermediate. Click on "more info" for details. 8-32, 3 flute, H5 Sowa Yellow Ring Spiral Pointed Tap. 2-1/8" OAL, .512" Thread Length. 4.5 pitch lead - intermediate. Click on "more info" for details. 8-32, 3 flute, H7 Sowa Yellow Ring Spiral Pointed Tap. 2-1/8" OAL, .512" Thread Length. 4.5 pitch lead - intermediate. Click on "more info" for details. 10-24, 3 flute, H5 Sowa Yellow Ring Spiral Pointed Tap. 2-3/8" OAL, .512" Thread Length. 4.5 pitch lead - intermediate. Click on "more info" for details. 10-24, 3 flute, H7 Sowa Yellow Ring Spiral Pointed Tap. 2-3/8" OAL, .512" Thread Length. 4.5 pitch lead - intermediate. Click on "more info" for details. 10-32, 3 flute, H5 Sowa Yellow Ring Spiral Pointed Tap. 2-3/8" OAL, .512" Thread Length. 4.5 pitch lead - intermediate. Click on "more info" for details. 10-32, 3 flute, H7 Sowa Yellow Ring Spiral Pointed Tap. 2-3/8" OAL, .512" Thread Length. 4.5 pitch lead - intermediate. Click on "more info" for details. 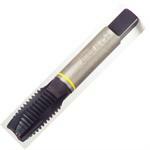 1/4-20, 3 flute, H5 Sowa Yellow Ring Spiral Pointed Tap. 2-1/2" OAL, .630" Thread Length. 4.5 pitch lead - intermediate. Click on "more info" for details. 1/4-20, 3 flute, H7 Sowa Yellow Ring Spiral Pointed Tap. 2-1/2" OAL, .630" Thread Length. 4.5 pitch lead - intermediate. Click on "more info" for details. 1/4-28, 3 flute, H5 Sowa Yellow Ring Spiral Pointed Tap. 2-1/2" OAL, .630" Thread Length. 4.5 pitch lead - intermediate. Click on "more info" for details. 1/4-28, 3 flute, H7 Sowa Yellow Ring Spiral Pointed Tap. 2-1/2" OAL, .630" Thread Length. 4.5 pitch lead - intermediate. Click on "more info" for details. 5/16-18, 3 flute, H5 Sowa Yellow Ring Spiral Pointed Tap. 2-23/32" OAL, .748" Thread Length. 4.5 pitch lead - intermediate. Click on "more info" for details. 5/16-18, 3 flute, H7 Sowa Yellow Ring Spiral Pointed Tap. 2-23/32" OAL, .748" Thread Length. 4.5 pitch lead - intermediate. Click on "more info" for details. 5/16-24, 3 flute, H5 Sowa Yellow Ring Spiral Pointed Tap. 2-23/32" OAL, .748" Thread Length. 4.5 pitch lead - intermediate. Click on "more info" for details. 5/16-24, 3 flute, H7 Sowa Yellow Ring Spiral Pointed Tap. 2-23/32" OAL, .748" Thread Length. 4.5 pitch lead - intermediate. Click on "more info" for details. 3/8-16, 3 flute, H5 Sowa Yellow Ring Spiral Pointed Tap. 2-15/16" OAL, .748" Thread Length. 4.5 pitch lead - intermediate. Click on "more info" for details. 3/8-16, 3 flute, H7 Sowa Yellow Ring Spiral Pointed Tap. 2-15/16" OAL, .748" Thread Length. 4.5 pitch lead - intermediate. Click on "more info" for details. 3/8-24, 3 flute, H5 Sowa Yellow Ring Spiral Pointed Tap. 2-15/16" OAL, .748" Thread Length. 4.5 pitch lead - intermediate. Click on "more info" for details. 3/8-24, 3 flute, H7 Sowa Yellow Ring Spiral Pointed Tap. 2-15/16" OAL, .748" Thread Length. 4.5 pitch lead - intermediate. Click on "more info" for details. 7/16-14, 3 flute, H5 Sowa Yellow Ring Spiral Pointed Tap. 3-5/32" OAL, .866" Thread Length. 4.5 pitch lead - intermediate. Click on "more info" for details. 7/16-20, 3 flute, H5 Sowa Yellow Ring Spiral Pointed Tap. 3-5/32" OAL, .866" Thread Length. 4.5 pitch lead - intermediate. Click on "more info" for details. 1/2-13, 3 flute, H5 Sowa Yellow Ring Spiral Pointed Tap. 3-3/8" OAL, .945" Thread Length. 4.5 pitch lead - intermediate. Click on "more info" for details. 1/2-13, 3 flute, H7 Sowa Yellow Ring Spiral Pointed Tap. 3-3/8" OAL, .945" Thread Length. 4.5 pitch lead - intermediate. Click on "more info" for details. 1/2-20, 3 flute, H5 Sowa Yellow Ring Spiral Pointed Tap. 3-3/8" OAL, .945" Thread Length. 4.5 pitch lead - intermediate. Click on "more info" for details. 5/8-11, 3 flute, H5 Sowa Yellow Ring Spiral Pointed Tap. 3-13/16" OAL, 1.102" Thread Length. 4.5 pitch lead - intermediate. Click on "more info" for details. 3/4-10, 3 flute, H5 Sowa Yellow Ring Spiral Pointed Tap. 4-1/4" OAL, 1.220" Thread Length. 4.5 pitch lead - intermediate. Click on "more info" for details. 1-8, 4 flute, H6 Sowa Yellow Ring Spiral Pointed Tap. 5-1/8" OAL, 1.496" Thread Length. 4.5 pitch lead - intermediate. Click on "more info" for details. 1-1/4-7, 4 flute, H6 Sowa Yellow Ring Spiral Pointed Tap. 5-3/4" OAL, 1.732" Thread Length. 4.5 pitch lead - intermediate. Click on "more info" for details. 1-3/8-6, 4 flute, H6 Sowa Yellow Ring Spiral Pointed Tap. 6-1/16" OAL, 2.00" Thread Length. 4.5 pitch lead - intermediate. Click on "more info" for details.